I've recently started figure painting from live models on a weekly basis. This is a first for me, but I'm very excited to be pushing into new territory where the failure rate (and degree of learning) skyrockets. I'd like to be bringing people more into my artwork and landscapes, and this open-ended, self-guided approach seemed like a good starting point. I must say, it's been an absolute blast, and I cannot sing its praises enough. Each morning is a sequence of timed poses with a 5-10 minute break in between- 10x 2 minute poses, then 4x 5 minute poses, then 2x 10 minute poses, until finally we wrap up with a 20 minute pose. The afternoon is 3x 20 minute sessions of the same pose- something that causes it's own issues, because there's really too much time available to screw around with things. 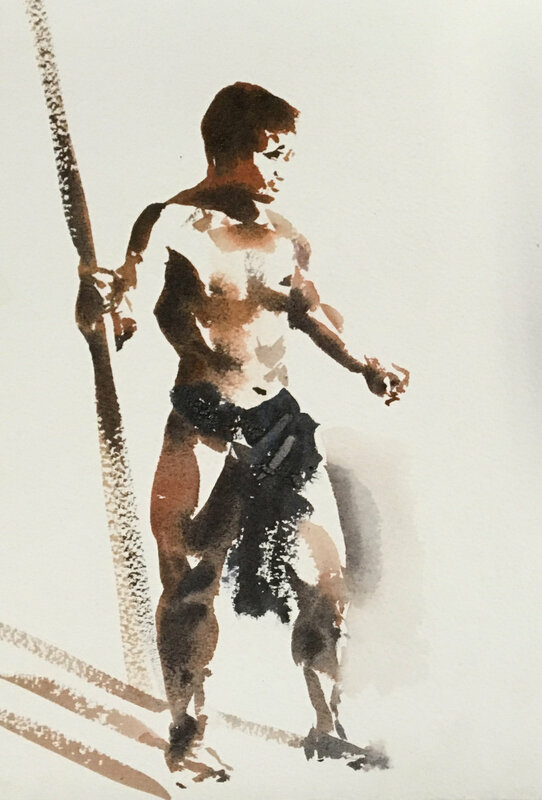 The real strength of the sessions, as I see it so far, is that the brevity of the poses require you to pay attention, reduce things to strong light and dark shapes, and be decisive in your line and brush work. Of course, painting the body helps me better understand mechanics and how to make the "weight" of people look real, but the skills I'm exploring really translate into all forms of painting. I left the first session looking at mountains and trees, thinking how similar they are to the body. It's all shapes dipped in light. These go by very fast. So fast, in fact, that I don't even paint them. It's bonkers. I've never seen so many artists really truly feverishly making marks. It's very exhilarating! Here you can see me warming up, from left to right. These next two sets are from week 2. I'm very excited to see where I'll be in 15 more weeks, as I feel a clear improvement between the two weeks. It's mostly mental- I'm thinking about proportions more, head size, where the center of gravity must fall. I see others using charcoal or conte on big sheets of paper, but for now I'm just using my 4B mechanical pencil in my sketchbook, like normal. Easily, the thing that turns me on the most about the process of making these very quick sketches is the Matisse-like importance of a strong, fluid line. When I can, I go right in and just keep on drawing that long dynamic through-line. If I make a mistake, I mostly leave it, but also, it's very liberating to have them all be only 2 minutes. I don't freak out about one sketch going over another, or doing more than one line where proportions are clearly off, or whatever... it's very free. I'm allowed to make mistakes. It's probably also worth noting how important these sketches are as learning tools. Probably more important than the painting phase that's down below. If you don't feel comfortable drawing the body, it's going to be incredibly hard to paint it. Whatever I have to learn, I feel confident mapping out the shape of the body, so when I get down to putting paint on paper, I'm only having to focus on the medium- how paint works and how I'm going to construct the body out of it. It's hard enough as it is. Trying to learn two things at once is more difficult than it needs to be. Alternately, despite being able to delicately, slowly draw a face just fine, I'm not particularly confident with the structure of the face done quickly, like how I'm doing these bodies. And that spills over into the paint. When I get to the face, I'm having to figure out what the shape of a face really looks like... at the same time that I'm trying to lay down paint. That's a recipe for failure. What it means is I need to quickly sketch a lot more faces- then when I go to paint them I'll already have a firm grasp on the basic facial structure all humans share, right from the get-go. This is really the cream of the crop, in terms of length. I wet the back of my paper ahead of time, during the break, and let it soak it. This makes doing wet into wet work much easier. I don't make a drawing here. Instead, my goal is to vividly pay attention and sort of "draw with my eyes". I focus on assessing proportions and seeing where elements of the body line up (such as where the shoulder falls in relation to the chin, or where an elbow is in relation to a hip, etc). I'm doing almost 10 total paintings each day, between the morning and the afternoon, not including the pencil sketches. That's... 150 quick paintings by June. So they're no longer precious. My goal, besides the immediate pleasure of painting, is more than to make an accurate painting. I want to train my mind and eye and keep the strokes immediate and fresh. So... no drawing. Here you can see some week 1 results- a 5 minute pose on the left, and two 10 minute poses on the right. In the 10 minute poses, with some planning, you can really start to do a bit of wet-into-wet modeling. My faces are only gestures for now, focusing mostly on the chin and the shadows under the nose and bottom lip, but the hands and feet are actually so important for expressing emotion and weight that I spend a lot more time on them than I thought I would. I can't deny a clear Wendy Artin influence. But, hey, if you're going to go there, might as well aim high, right? I'm learning a lot on the job, so to speak. I've not done figure drawing from a live model before. So, many are throw-aways for sure, but there are others I'm pretty satisfied with! I will say that it's very clear how important the lighting is for quick watercolor studies. Sometimes the subject is lit straight on. This is very hard, as there's less modeling. It's far easier looking "down the light" or from the side, such as the painting below. Here, the arm is easily defined against the darker shadow of the torso. This would be much harder to do if she weren't lit from the right side. These are, counter-intuitively, the toughest for me. There's simply too much time. I find myself noodling around sometimes, waiting for a pose to be over. That's bad news. Still, I figure if I'm having a hard time and find it frustrating, then that must mean I'm learning something! :P So I stick with it. Here you can see the kind of wet-into-wet modeling you can build up though. There are parts of the torso that are ok, but there's a lot that's pretty chunky. 20 minutes is a while. You can get into lots of trouble if you're not careful!